Heat protection spray// I love Tressemé's heat protect defence styling spray as it smells great, doesn't weigh my hair down or make it greasy aaand it's pretty cheap. It's also quite a sizeable bottle so it's lasted me a while too. Use this every time before straightening or blow drying. Argan oil// put it on towel dried hair before you blow dry and it will decrease the time it takes to dry your hair and add moisture. You should only use a little on the ends though, or your hair will feel greasy. It's not too expensive- this bottle was about £10 and it's lasted me years. Use a hair mask or deep conditioner// You need to do this about once a week, and definitely straight after bleaching your hair. I've heard good things about Aussie 3 minute miracle, but when I tried it I found it underwhelming. A few good hair masks I've liked are: VO5 give me moisture, Herbal essence's bee strong, Bleach London's reincarnation mask (make sure to use this as per directions though). You could also use coconut oil but it's pretty greasy and a bit of a pain to wash out- my recommendation would be to use it before you shampoo. Another winner for me is the Tressemé Keratin Smooth Treatment Masque (which sometimes goes on offer for just £2!) it does what it says on the tin. Dry shampoo// you can't wash your hair every day with bleached hair, you just can't. Batiste is my weapon of choice for this, because it is cheap and does the job. I don't think you're meant to use too much dry shampoo as it can dry your hair out too. Tangle Teezer or a gentle brush// Bleached hair is prone to snapping more easily, so a good brush is essential. 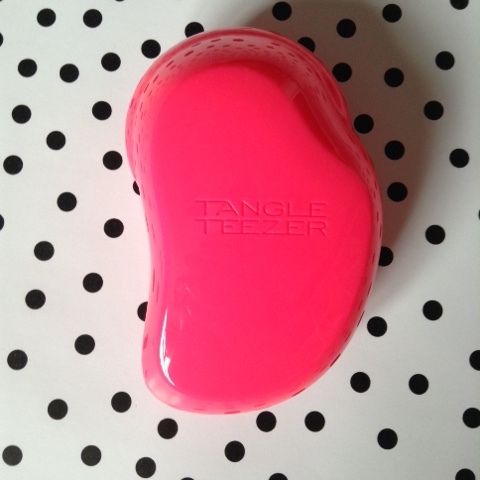 Last year I upgraded to the tangle teezer (check out my tangle teezer review) and I really think it helps prevent breakage in my hair. Be especially careful brushing your hair when it's wet though, as that's when it's most likely to break. Avoid hairspray, salt spray and back combing your hair// These all dry out/ damage your hair like crazy! Use a silver shampoo// a purple toned shampoo will keep brassy tones out of your hair. I've tried a few, and am on the hunt for the ultimate silver shampoo, but for now I'm switching between Bleach London and Lee Stafford. Trim your split ends regularly// Spit ends make your hair tangle and snap off, and if you cut them off quickly they won't carry on splitting. Your hair will thank you for it. Also, if you're cutting your ends by yourself, do grab some actual hairdressing scissors. Try using semi permanent or vegetable based dyes// like Lariche's directions. Not all hair dyes are created equal, and while some like directions will leave your hair feeling smooth and lush, others will dry your hair out and damage it even more. Vegetable based or semi permanent dyes don't damage your hair and act more as a conditioner. Bonus points if you mix in a hair mask while you're dying your hair. Well there you have it~ I hope this post was useful! Have you got any favourite products I should try? I'd really love to hear people's recommendations!